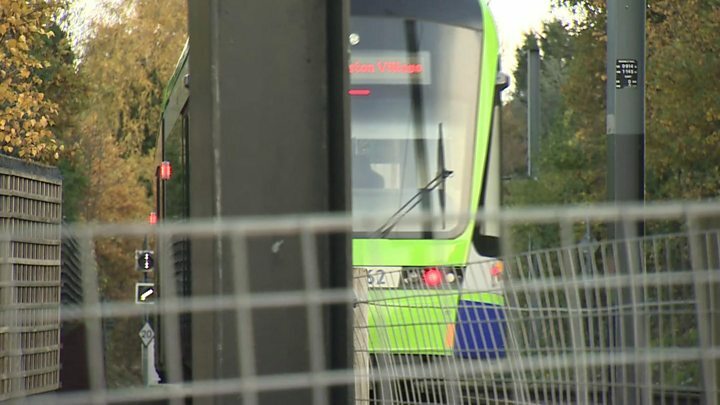 Services on the Croydon tramline have reopened 10 days after a tram derailed, killing seven people and injuring more than 50. Transport for London (TfL) said additional speed restrictions and signs had been introduced near the site of the accident. It said engineers had repaired the track and a safety assessment had been carried out. An interim crash report found the tram was going 43.5mph in a 12mph zone. Following advice from the Rail Accident Investigation Branch (RAIB), TfL has imposed a further speed restriction before the existing bend in the section of track near Sandilands. Further speed restrictions have also been put in place at three other locations on the tram network as a safety precaution. There was no publicity and no fanfare as Croydon's tram system got up and running again. The families of those who died had been informed it was happening and on all of the stations and on all of the trams are notices explaining the new speed restrictions. There are also phone numbers on the posters for passengers to report speeding and concerns on the trams. I was on one of the first trams out of New Addington. The new 12mph speed limits are now in the tunnel before the bend where the tram derailed at 43.5mph. On the tram passengers were glad the trams were running, but it was bittersweet. Some said they were a little nervous, some said they were still shocked. And as the tram crept round the bend of the derailment - marked only by orange traffic cones - the carriage seemed to fall silent for a moment. The report found there was no evidence of any track defects or obstructions. An investigation also found no malfunction of the braking system. Tram services were suspended between East Croydon and Harrington Road, Addington Village and Elmers End to enable British Transport Police (BTP) and the RAIB to investigate and allow TfL engineers to carry out repair work. Crystal Palace football club said on Friday it would be holding a minute's silence prior to its home game against Manchester City on Saturday. Palace manager Alan Pardew said the club would support those affected by the Croydon tram crash "in any way we can". Several of the the victims' families are expected at Saturday's match.